So far I have written about the problem we had, the requirement for the solution, then did a deep dive into the actual implementation and finally I talked about the improvement in performance, which was a nice double digits improvements in percentage. There are a couple of tricks there that I still want to talk about, but that is pretty much it. Except that this actually misses the entire point of this exercise. What the blittable format gives us is immediate access to any property without the need to parse the whole thing. How important is that for us? I removed all I/O from the benchmark, and I'm testing only the cost of loading documents already saved in RavenDB and getting those properties from them. And that is what I'm talking about . Is this already part of RavenDB or is it yet to come in some of the future versions? Very interesting series and work you are doing here - really appreciate how you document and walk through things like this. With regards to naming the format as comments from your earlier posts how about the "Odin" format? From Wikipedia "The Prose Edda explains that Odin is referred to as "raven-god" due to his association with Huginn and Muninn. In the Prose Edda and the Third Grammatical Treatise, the two ravens are described as perching on Odin's shoulders." Look forward to seeing how the new format progresses in Raven. Stunning. How did the memory performed? Can you say something about that? Edward, I'm not sure that I understand the question. By "the memory" do you mean the blit format? This blit format wil only work with Voron, since with Esent you do not have a memory mapped file? 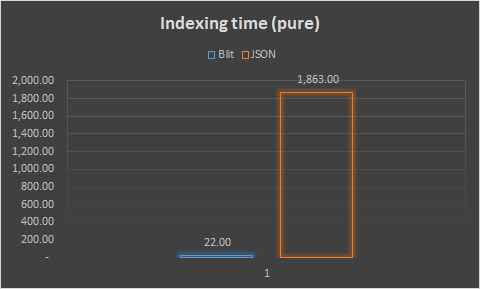 I mean the memory cost of accessing those properties blit vs json. It seems it would be good for the community if we could nuget install this as a json reader/writer. I am running on some .NET code which could use this. It is on mono/unix though, where I can't use RavenDB.